Subrahmanya, Dec 2, 2015 : The skeletal remains which were found in the reserve forest area near Subrahmanya on November 30, Monday is suspected to be that of Tirumaleshwar (23), a resident of nearby Argudi area. Though police consider this to be a case of suicide, rumours are afloat that the youth was murdered. 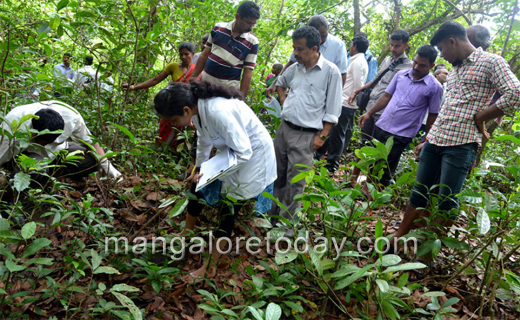 On December 1, Tuesday, forensic officials Dr Arun and Dr Bhuvaneshwari visited the place where the skeletal remains were found and conducted an autopsy in the presence of the police. A rope was also found tied to a tree giving indication that the man might have committed suicide. A pair of slippers and pieces of clothes were found nearby. The skull was found a little distance away. Samples of the skeletal remains have been taken for a forensic test. Subrahmanya police have registered a case of suicide and are investigating the case. Tirumaleshwara who was the son of late Dasappa of Argudi was a labourer and was irregular to home. He lived a solitary life after the demise of his parents and suicide of his brother a few years ago. Meanwhile, none had bothered to lodge a missing complaint when Tirumaleshwara had gone missing. However sources say he used to frequent the house of a neighbouring woman. It is also being said that the pair of slippers found at the place where the skeletal remains were found were not that of Tirumaleshwara. Rumours are also afloat in the area that Tirumaleshwara was murdered.